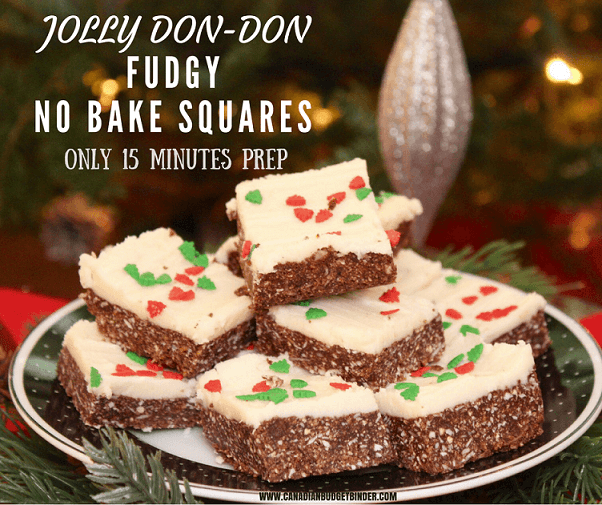 If you’re super busy for the Christmas holidays like we are you will appreciate our signature family Jolly Don-Don Fudgy No Bake Squares that take 15 minutes to prepare. We’re feeling excited as it’s coming closer and closer to Christmas which means I’ve been busy baking up a storm in the Don kitchen. You will LOVE what these fudgy no bake squares look and taste like especially since they are unique to our family. This is one less holiday recipe that you won’t have to worry about spending time in the kitchen for so you can get on with other tasks. These fabulous Jolly Don-Don Fudgy No Bake Squares take 1 hour to chill in the refrigerator and you’re ready to serve to your guests. What you end up with is a lovely dense graham cracker crumb on the bottom, fudgy chocolate coconut center topped with a buttercream vanilla milk icing that is sure to hit all those sweet notes. I love adding candied orange peel to the crumb as it gives a bit more to the taste and flavour. We’ve had our snow storms out west and now the ice-rink in the back garden is just about ready for our kids to enjoy for the winter. The temperatures are just right for freezing the water on top and then Mr. Don turns into Zamboni-man Don and creates the smooth surface. Our Christmas tree is up and decorated and even some presents under the tree all nicely wrapped in the tartan paper I found at Costco. I like to bring a touch of Scotland into my decorations at Christmas time as it reminds me of home. Scotland at this time of year can be snow-covered too mostly in the highlands but the lowlands do get a sprinkle of snow now and then. I said to mom the other day that I would personally ask Mother Nature to push it over her way but she wasn’t keen about that. The hustle and bustle of the holidays are here and I have a few projects under my belt to complete before the festivities begin along with posting Christmas cards. Topping my to-do list is to finish baking my holiday cookies, squares, balls and bars for visitors and neighbours. Once they are out of the way I can sit back and relax my way into the holidays. Get your baking ingredients ready and let’s make some sweet treats for Christmas starting with our family favourite the Jolly Don-Don Fudgy No Bake Squares. Over the Christmas holidays I like to have prepared homemade desserts that my friends and family will love. Each year I try to have an assortment on the table and my Don-Don Chocolate No Bake Squares are always a hit. Mix graham cracker crumbs, coconut, cocoa, granulated sugar, candied orange peel and ground almonds in medium bowl. Stir in the melted butter and water. If it's not coming together then add a bit more melted butter. It should hold together when squeezed in your hand. Press into a 9x9x2 un-greased square pan then place in refrigerator whilst getting topping ready. Mix the rest of the ingredients (except decorations) into a bowl, if necessary, stir in a small teaspoon milk until the mixture becomes spreadable. Take base out of the refrigerator and smooth on the layer of frosting. Leave to harden in the refrigerate for 1 hour. Holiday baking doesn’t have to be expensive nor do you have to rush out to buy pre-made cookies and squares from the bakery because you have limited time. No complaints here from my family so I hope you all enjoy our cheerful Jolly Don-Don Fudgy No Bake Squares this Christmas. 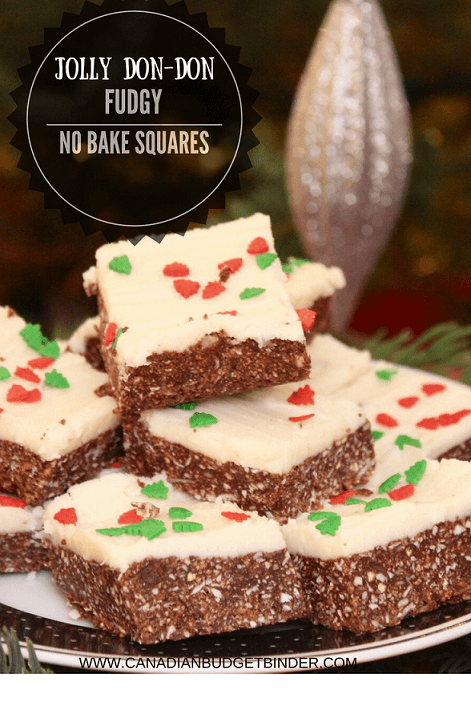 What are some of your favourite no bake squares to make for the Christmas holidays? Nice Nicola, it’s another no bake recipe and it’s more delicious than graham cakes! 5 stars! Thank you Jamie! These are fantastic. And so easy to make it’s just the waiting I can’t stand lol. I sometimes cheat and stick them in the freezer shhh don’t tell anyone lol!